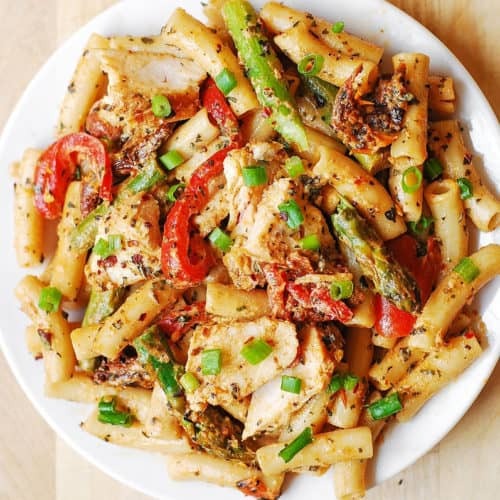 Chicken Alfredo Pasta with Bell Peppers, Asparagus, in a Creamy Sun-Dried Tomato Sauce. The very creamy alfredo sauce is made completely from scratch with half and half, freshly shredded Parmesan cheese, basil and crushed red pepper! 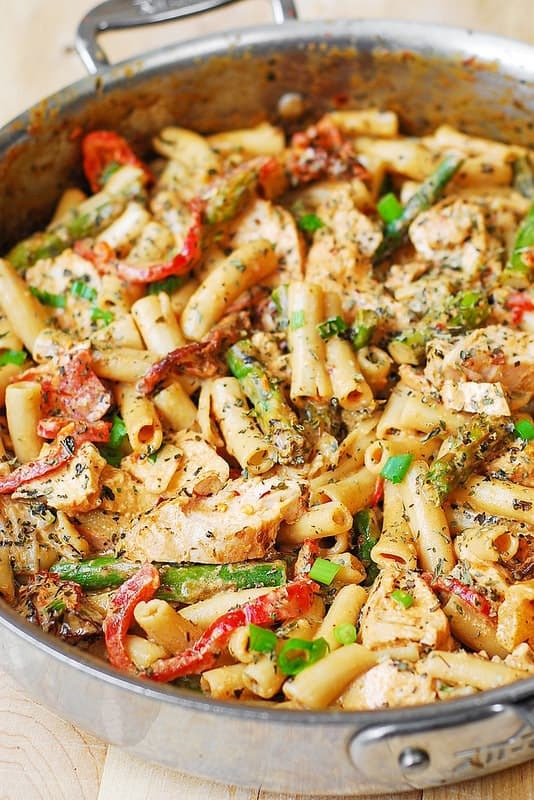 This chicken and vegetable pasta is very easy to make, it’s colorful and vibrant! All the ingredients and the vegetables complement one another nicely. 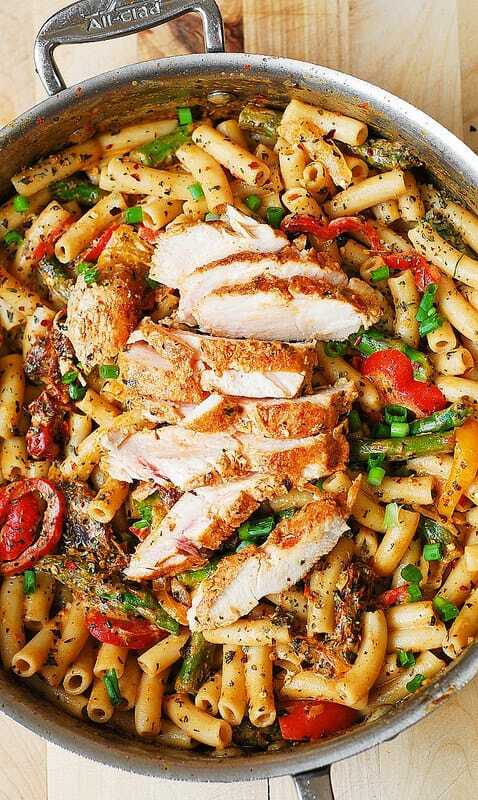 It’s a quite good-looking pasta dish, don’t you think? No surprise here – if you combine all those colorful vegetables together with pasta, creamy sauce, and grilled chicken – it better look good! But looks are deceptive – this dish is embarrassingly easy to make! My instructions might seem long, but it’s only because I like to explain everything in detail, to prevent future questions. The recipe really could be condensed into 5 lines. Use sun-dried tomatoes in oil in a jar. Drain them from oil before adding to the skillet. Reserve the oil from sun-dried tomatoes to saute the vegetables. Don’t overcook the asparagus: cook it just enough so that it still has some crunch. Season your cream sauce generously with salt and crushed red pepper flakes: they really help to bring all the flavors together. Use pre-cooked chicken breasts or grilled chicken. Slice it thinly. Save some cooked pasta water. If your cream sauce gets too thick, use a small amount of pasta water to thin it out. Use 1/2 cup of milk and 1/2 cup heavy cream to replace 1 cup of half and half. 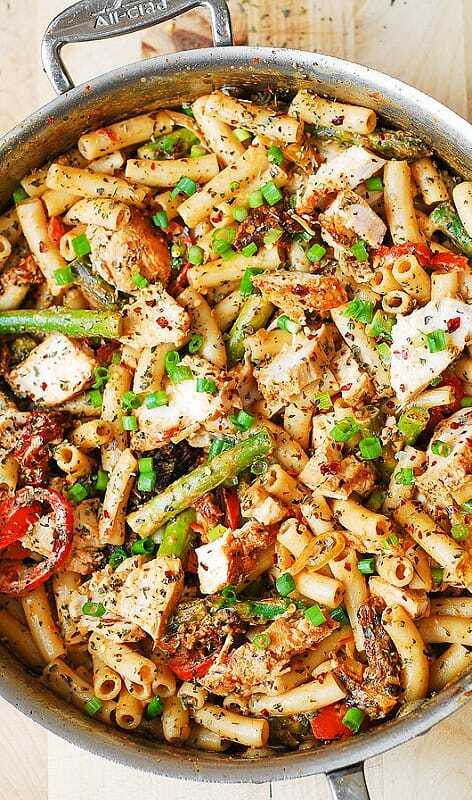 To make the recipe gluten free, use gluten free brown rice penne. After cooking gluten free pasta in boiling water, rinse it with cold water to stop cooking. This will prevent the gluten free pasta from getting too soft and mushy and you will have your gluten free pasta “al dente” style. Use either shredded Parmesan or shredded Mozzarella cheese. Vibrant and colorful Summer pasta made only better with easy, homemade version of Alfredo Sauce. 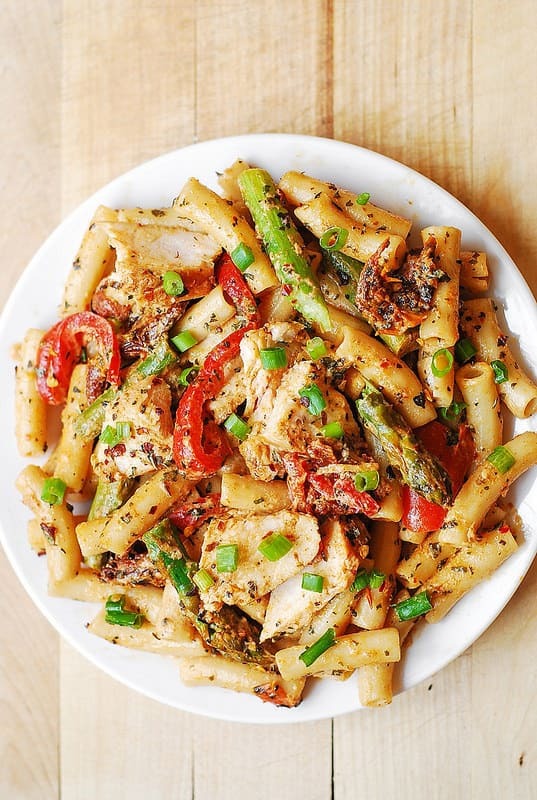 This Creamy Chicken and Vegetable Pasta with Bell Peppers, Asparagus, and Sun-Dried Tomatoes will become a family favorite in the Summer! Thank you! Heavy cream works too, even though I prefer half and half as a thinner version of heavy cream. Light, bright and delicious. The best pasta ever. Can u please tell me what half & half is??? Half whole milk and half heavy cream. Called single cream in UK. In the US it’s well known as half & half or what is being to referred to when adding “cream” to a coffee at a coffee shop. I made this tonight and I feel like when I put the cheese in it gloppted onto the veggies 🙁 is that normal? Tiffany, if that happens, bring everything to boil, add more liquid (reserved pasta water) to the sauce and keep stirring, while everything boils, until the cheese melts. This always resolves this issue and makes the sauce nice and creamy. I was wondering what is ‘Half and Half’?